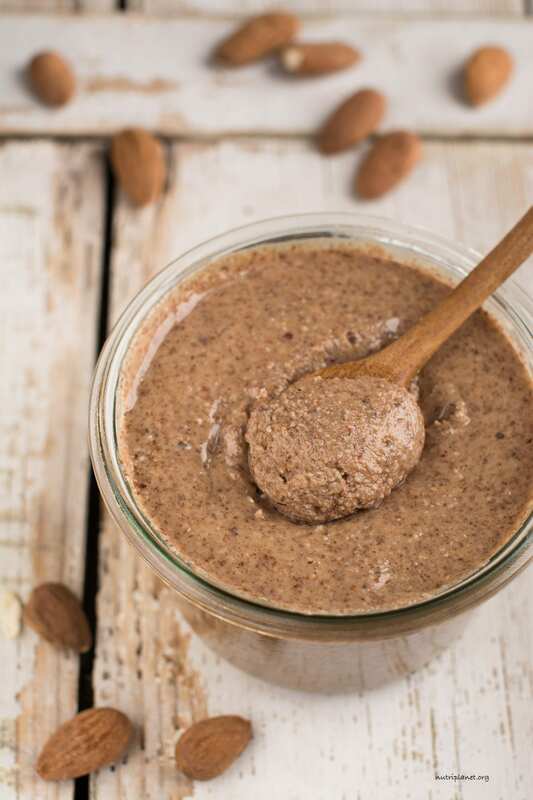 You only need 1 ingredient and a powerful blender to make raw almond butter at home. 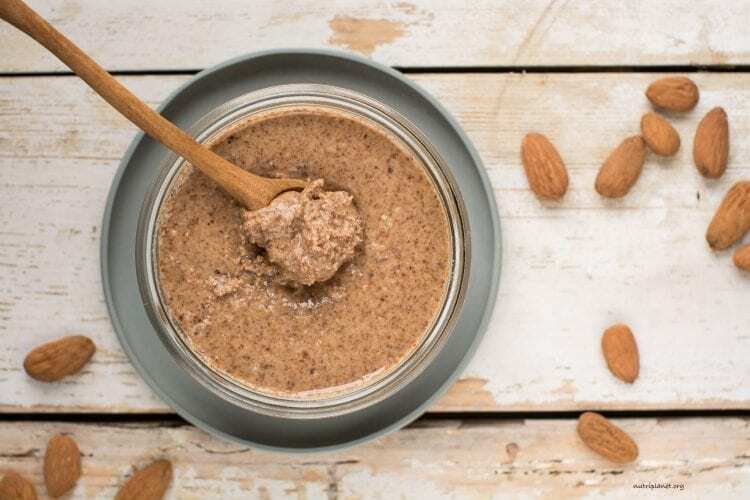 Enjoy your smooth and creamy homemade almond butter with no additives and pay 2-3 times less compared to store-bought varieties! In a nutshell, make almond butter at home and you don’t need to worry about any additives, i.e. palm oil, coconut oil, sugar, and preservatives (to make shelf life longer). 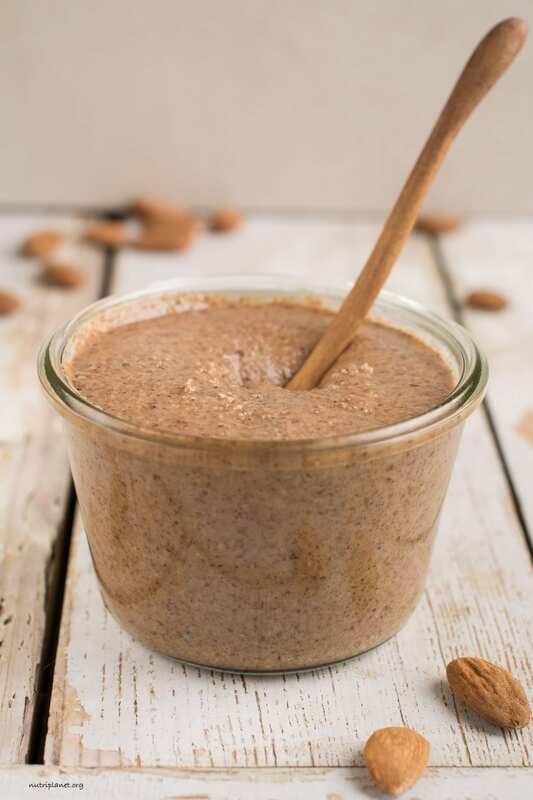 Be aware that making almond butter requires much more patience than for example cashew butter, because almonds don’t turn into creamy butter as fast as cashews do. However, the outcome is so rewarding that you’ll forget about the effort when you have jars of homemade almond butter in your fridge. Tips for buying and storing almonds. Why I prefer organic almonds. How to soak and dehydrate almonds + benefits of soaking. Signs that you need to soak your nuts and seeds. Tips for buying jars of almond butter. And finally, why it is not a good idea to roast almonds. Secondly, if possible, buy them in vacuum packaging. Thirdly, never buy loose almonds – air and light makes the oils go rancid. Once you open the package, store the almonds in airtight containers in refrigerator or freezer (long time storage). Chia seeds and flax seeds are the only exception, as they can stay at room temperature without spoiling. However, put them in fridge as soon as you grind them! Almonds (as any nuts and seeds) are apt to absorb pesticides readily due to their high oil content. Moreover, the amount of pesticides used for growing nuts has been consistently rising in recent years. In addition, non-organic nuts are often treated with fumigants (gases to kill bugs) after they are picked. So, it becomes easy to see why you should be wary of them. And finally, to kill microbial pathogens, insect pests, mould, and other spoilage organisms, manufacturers irradiate the nuts. This practice is known for potentially creating dangerous carcinogenic by-products. Soak almonds in glass or ceramic container in filtered water for 8-12 hours. Add ¼ tbsp. of sea salt for each cup of nuts. Rinse carefully to remove salt residue. Alternatively, use acidic medium such as lemon juice or apple cider vinegar – just add a splash to soaking water. Dehydrate almonds until they are crisp again at maximum 46°C (115°F) for 12-24 hours or until completely dry. Make sure they are fully dry or they could become mouldy. I have found many references to soaking nuts, grains, and seeds in water, salt water, or a warm water mixture with something acidic like apple cider vinegar or lemon juice. 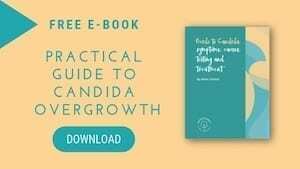 However, some sources say that within 7 to 24 hours the enzyme inhibitors are neutralized and the anti-nutrients are broken down regardless of the method you choose. Soaking nuts, grains and legumes is especially important for those with sensitive digestive system. Unsoaked nuts have phytic acid that inhibits mineral absorption and causes digestive ailments. However, you can easily neutralize the phytates and enzyme inhibitors by soaking the nuts in salt water (or salt and apple cider vinegar water) and dehydrating them at low temperatures. Soaking removes or reduces phytic acid and tannins as well as neutralizes toxins and enzyme inhibitors. The monounsaturated fats in almonds keep you full and help you avoid binge-eating. Soaking almonds also releases enzymes, which in turn help with digestion. Vitamin E in soaked almonds works as an antioxidant, which inhibits free radical damage that prevents aging and inflammation. Soaking makes the proteins more readily available and increases the amounts of vitamins, especially A, C and B vitamins. Soaked almonds help in lowering and maintaining glucose levels and regulating high blood pressure. Soaking improves flavour and texture of almonds. Your diet contains a lot of phytate containing foods, i.e. grains, beans, nuts and seeds? You notice pieces of nuts in your stool. You’re having low belly pain after eating unsoaked nuts and seeds. You’re having trouble consuming enough minerals and B-vitamins. Store-bought almond butter on the other hand can even have adverse effects on your health. Especially, if the almond butter is made of conventionally grown, unsoaked, irradiated, and roasted (probably even oil-roasted) almonds with added oils, sugars and preservatives. Always opt for organic almond butter. Prefer unroasted nut butters. If roasted, prefer dry roasted almond butter. Watch out for any additives, i.e. oils, sugars and preservatives. Look for 100% almonds in the ingredients’ list. If you can afford it, buy activated sprouted almond butter (some brands make the extra effort and soak/dehydrate their nuts and seeds). However, you end up paying three times more as opposed to buying raw almonds and making your own almond butter at home. Start by soaking 3 cups of almonds (414g, 14.6oz) for 8-12 hours (see instructions above). Then, dehydrate until fully dry. You might skip the first 2 steps, if your digestion can handle the phytates and enzyme inhibitors in raw inactivated nuts. Next, pour the dehydrated almonds into high-speed or high-powered (at least 1000W) food processor. Then, start processing. Scrape down the sides whenever the almonds start to stick to the walls and bottom of your food processor. When the oils start to separate, the half-done almond butter will form bigger clumps and finally you’ll see one big ball of almond paste running around the processor. Don’t stop there! It might seem that it takes forever, but you’ll have almond butter in the end! Separate the ball with a spoon or spatula and continue processing. Soon you’ll see that the ball starts to come apart and the paste will look more and more like real almond butter. Process a little bit longer and you’re done! It’ll all take about 45 minutes with 1000W food processor. So, be patient and make sure to give your processor short breaks not to overheat it. I gave mine a 5-minute break at 35 minutes. Nutritional info per one tablespoon (16g, 0.6oz): 95.2 kcal, 3.46g carbohydrates (10.3% of kcal), 7.98g fats (75.4% of kcal), 3.39g protein (14.2% of kcal), 2g fibre, 0.16mg sodium, and 0 GL points. 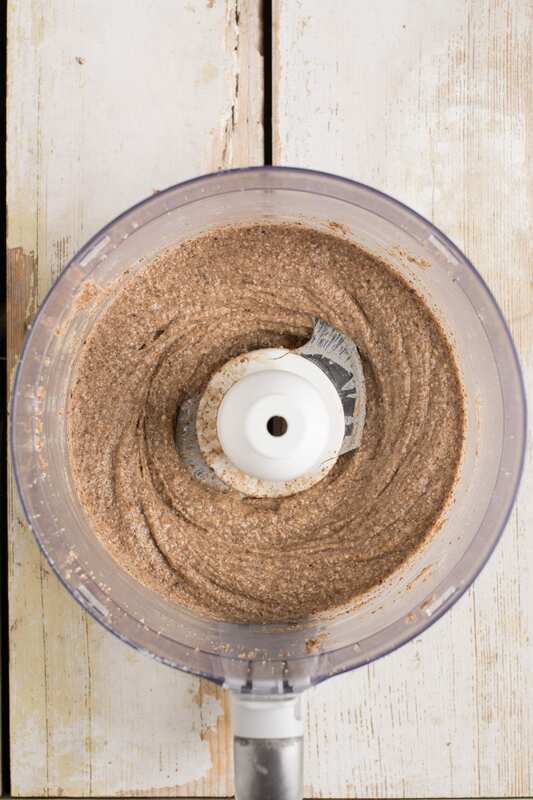 Take it one step further and make sprouted almond butter – sprout the almonds before dehydrating them. It’ll take about 12 hours after you’ve soaked your almonds. 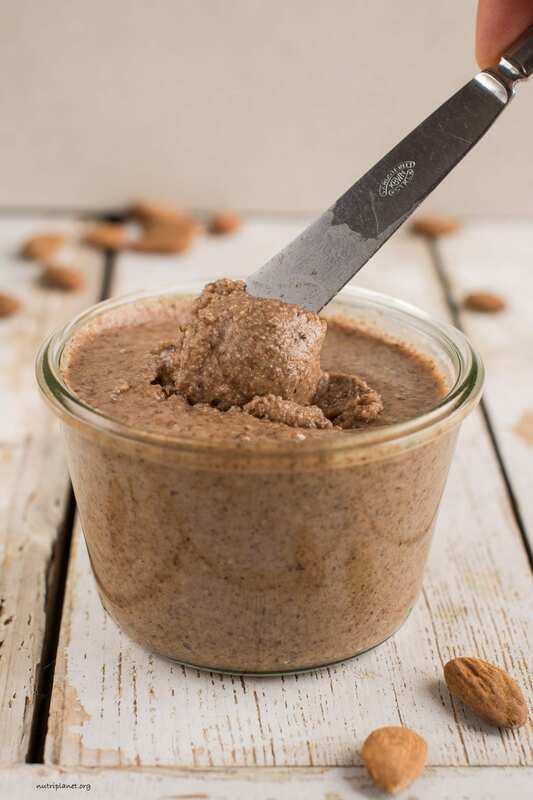 Make chocolate almond butter by mixing some cocoa and/or carob powder into your nut butter. I suggest putting a bit more of almonds to soak, if you intend to eat some while they’re dehydrating and maybe make a small batch of almond milk as well. You don’t need the latest and most powerful food processor to get the job done. Most probably you’d get faster results with high-powered blenders like Vitamix, but you definitely can do without. I prepare my homemade nut butters in 6-year-old 1000W Kenwood. Store your almond butter in an airtight container in fridge. You can also make cashew butter and peanut butter using the same recipe. Eat as is or with raw apple slices, carrots, celery, bell pepper. Mix into desserts or add into or on top of your porridge. You can spread it on your toast, waffle or pancake. Make raw candies with almond butter and one or few of the herbal powders – cocoa, carob, mesquite, reishi, spirulina, and/or cinnamon. Add a pinch of Himalayan salt to enhance the flavours and a preferred sweetener (stevia, xylitol, maple syrup, coconut nectar/sugar). You won’t need to add anything for sweetness when using carob and/or mesquite, as they are naturally sweet. Some almond butter snacks on my blog: almond butter protein balls, almond butter cups, almond butter brownies. I do not recommend roasting the almonds (or any nuts). After all, soaking and dehydrating process is more careful when it comes to preserving the health benefits of nuts and seeds. You should be especially cautious about commercially roasted almonds (or any nuts) as they’re often flash-fried in cheap, rancid oils. Even though dry roasted nuts are a better alternative, they’re still exposed to high temperatures that alter the nutrients and cause the breakdown of fats, and therefore increasing free radical capacity. Whenever I need to buy nut butters, I go for raw organic almond butter (or any other nut or seed butter). Hi! Just wondering what the point is to dehydrating them. Because no water = longer shelf life? Also…would a Vitamix blender be a good choice for blending this? Or should I stick with the food processor? If processor is the only way to go…what if my food processor is huge? Would it need to be just the right size to be able to process all the way to butter? And lastly… What about the leftover meal from making almond milk? I can dehydrate it and save it as almond flour. But could I also add it, with the whole almonds, to make almond butter? Or would it dry it out too much, being that much of the fat was taken out for the milk? You’d get a watery puree (and not nut butter) if you skip dehydrating. I guess Vitamix blender would work fine. My processor is 1500ml and I used 400 grams of almonds. Yes, you can dehydrate the almond pulp. I also like to grind it into fine flour and use in baked goods and porridge. I wouldn’t recommend adding this to the butter though — it’d make it too dry (as you guessed). Try cashew butter on bread and then add some strawberry jam on top. AMAZING! Yes, I love homemade cashew butter as well!